RRB Assistant Loco Pilot Question paper & Answer Key 2018 Analysis: Railway Recruitment Board (RRB) Assistant Loco Pilot and Technician Grade III written test for various RRB regions have been conducted from 9th August to 31st August. As per reports, more than 70 lakhs candidates have competed for the examination this year. The Railway Department has announced 26,502 ALP and Technician Grade III posts this year. Hence the department announced a large number of posts, the competition is also severed for the posts of ALP & Technician Grade III. Almost all the applicants have competed for the ALP written test this year. 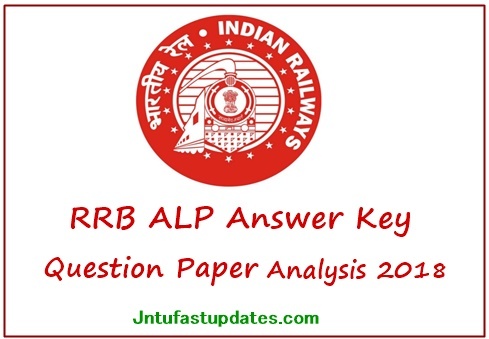 All the competitors who have competed for the RRB ALP examination can soon download RRB ALP Answer Key 2018 in PDF format. The answer key for all sets will be accessible to download for the competitors. Hopefuls who have competed for the RRB ALP/Technician Grade III examination can download RRB ALP/Technician Answer Key from the Indian Railways official website, indianrailways.gov.in or from the RRB Regional websites. Direct links to download RRB ALP Answer sheet 2018 were mentioned below. By clicking the links aspirants can get the answer sheet/question paper solutions and can compare with their attempt to estimate the score. Railway Recruitment Board is one of the largest boards of India. This is the central government authority that mainly functions for the railway recruitments. Annually, the RRB announces various jobs for the interested and eligible aspirants. Based on the merit of aspirants, the RRB hires the suitable hopefuls into the jobs. This year the RRB has released the notification for 26502 ALP/Non-Technical Grade III posts. A huge number of aspirants seeking for the Railway jobs have applied for the RRB Loco Pilot Technician Grade III vacancies. For the selection of suitable aspirants, the RRB has conducted the Grade III Examination in April/May months. Candidates have appeared for the Computer Based Test (CBT) Examination. All the aspirants those have come across the CBT Examination can check the RRB ALP/Grade III Answer Key 2018 PDF for all sets within 3-4 days after the examination. Candidates competed for the test can get the answer keys from the regional RRB websites. Hopefuls competed for RRB ALP examination this year can download RRB ALP/Technician Grade III answer key from the corresponding regional websites. The RRB has conducted the ALP and Technician Gr 3 examination in 21 regions across the country. The RRB is going to release the official answer keys within 3 to 4 days of the examination. Candidates need to stay patient to download the answer keys. Hopefuls can download the answer sheet for all sets and by comparing the answers given in it, the estimation of the probable score can be done. The RRB is going to release the RRB ALP/Technician Region-wise answer keys for all regions including, RRB Ahmedabad, RRB Bangalore, RRB Kolkata, RRB Ajmer, RRB Allahabad, RRB Bhubaneswar, RRB Bhopal, RRB Bilaspur, RRB Chennai, RRB Chandigarh, RRB Gorakhpur, RRB Guwahati, RRB Jammu and Kashmir, RRB Mumbai, RRB Malda, RRB Muzaffarpur, RRB Ranchi, RRB Secunderabad, RRB Patna, RRB Thiruvantha-Puram and RRB Siliguri. Hopefuls can check the direct links provided below to download the answer sheets. Aspirants can check their probable score they are going to obtain in the test by downloading the RRB ALP/Technician Answer Key. Hopefuls competed for the posts can check whether they score the minimum cutoff marks or not. So that the competitors can analyze their future perception in the competition. Few of the training institutes and other organizations provide the RRB ALP unofficial answer keys soon after the examination is completed. Hopefuls can visit the corresponding portals to get the immediate answer keys and to evaluate the score. After counting with the unofficial answer keys, hopefuls can wait for the official answer keys which are going to be provided by the RRBs and can compare with them to estimate the accurate score. RRB Alp Exam was conducted in Morning and Afternoon shifts as shift 1, shift 2. Question paper analysis and coaching institutions unofficial answer keys provided below. Aspirants qualified the RRB ALP 1st round CBT with requisite cutoff marks will have the chance to attend the 2nd round of selection process. The 2nd round CBT is going to be conducted in the month of December for the qualified aspirants. Hopefuls competing to get Railway Jobs can go through the RRB ALP Schedule 2018 from the following. rrb.gov.in – Is the official portal of RRB. Have a look at the page. RRB Technician Gr 3 Answer key 2018 Link appears in this section. Click on the link.